Customer surveys at Cafepress have shown that customers are happier about their order when everything is presented well. One of the components I am sure most t-shirt retailers and other companies have ignored are receipts. Personally, I can’t think of an online retailer that has made a receipt memorable. Until now Cafepress receipts have been similar to any other company with an 8×11 piece of paper. The actual receipt has changed in size to be like a department store receipt and also includes the product url which is really important when you offer as many products as Cafepress offers. 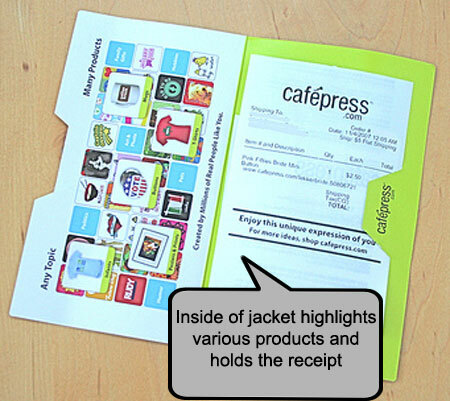 The receipt is in a “receipt jacket” that highlights a variety of designs and products to leave a lasting impression that Cafepress has diverse and unique products and gift ideas. Thanks to JGoode we have some pictures of the new receipts from her purchase of a mini-button. 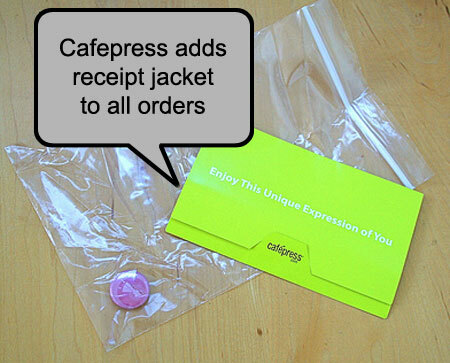 While it’s not going to guarantee that the receipt isn’t going to get thrown in the garbage once they get the product it may indeed improve a customers impressions of Cafepress and the shopping experience. A receipt is a little thing in the big picture but every little thing adds up to build an opinion of a company or the overall shopping experience. If you want to see a receipt for yourself go buy something at Cafepress.